Physicians for Human Rights-Israel strongly urged the transfer of responsibility for prisoners' health from the Israel Prisons Service (IPS) to the health ministry in order to ensure detainees' health was put ahead of "security considerations". "Medical ethics and human rights violations carried out by the IPS, specifically by prison medical practitioners... endangered the lives of prisoners and detainees on hunger strike," PHR said in a report. The abuses it cited included "preventing independent physicians from examining and monitoring the medical condition of hunger strikers... and blocking the transfer of prisoners on hunger strike to civilian hospitals." The deteriorating health of several prisoners on long-term hunger strike in Israeli jails has prompted thousands of other prisoners to stage shorter-term fasts and sparked widespread protests on the Palestinian street. It also raised the recent death from cancer of a long-term Palestinian prisoner, whose demise sparked violent protests and prompted the Palestinian Authority to accuse Israel of medical negligence. PHR also expressed concern over the case of an Australian-Israeli national called Ben Zygier, a reported Mossad agent who was locked away in 2010 under top-secret conditions and later hanged himself in his cell. It said the prison medical service "operates according to political and security considerations rather than medical considerations... (and) worsens situations of dual loyalty, a problem already rampant among medical practitioners employed by the IPS." The group said responsibility for health issues should be transferred from the prisons service to the health ministry. "PHR-Israel calls for the establishment of a committee that will examine the possibility of transferring control and responsibility for the medical services inside the prisons from the Israeli Prison Services to the Ministry of Health," it said. "Such a transfer would make the level, availability, and quality of services, equal -- if not on par -- with the type of services accessed by the general population," it said. In countries that had made a similar transition of responsibility, "considerable improvements are noticeable... with regards to improvements in the level of services (and) in the amount of harm sustained as a result of rights-based offences." Meanwhile, in a related development the left-leaning Haaretz newspaper printed excerpts from a letter addressed to Israelis from long-term hunger striker Samer Issawi, who medics say is very close to death's door after refusing food since August. 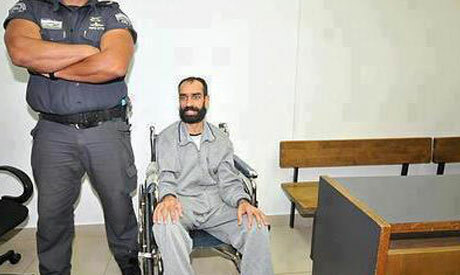 "I am Samer al-Issawi, 'one of them Arabs' in your army's terms. That Jerusalemite you locked up for no good reason but that he decided to leave Jerusalem to the city's outskirts," he said, referring to his arrest on grounds he took his car to be fixed in a West Bank garage in violation of the terms of his 2011 release from jail. "Hear my voice, the voice of remaining time -- mine and yours... Don't forget those you have incarcerated in prison and camps, between the iron doors that imprison your consciousness," he wrote. "I'm not waiting for a prison guard to free me, I'm waiting for the one who frees you of my memory." Haaretz said Issawi had handed the letter to several Israeli women who had begun visiting Kaplan hospital in Rehovot where he being held. He was one of hundreds of long-term security prisoners released by Israel under a prisoner swap deal in October 2011, but he was rearrested in July last year following allegations that he violated the terms of the agreement by leaving east Jerusalem and going into the West Bank.